Expand your university experience with a variety of study abroad opportunities. Study abroad is life-changing and essential for the modern student. Study abroad creates global awareness, enhances academic learning, develops leadership skills, adds to personal growth, and can help students advance their careers. Immerse yourself in language and culture at popular study abroad destinations such as England, France, Mexico, Italy, Spain, Scotland, and Japan. There's a whole world waiting for you! “I feel like The W is very encouraging in getting students to try new things. 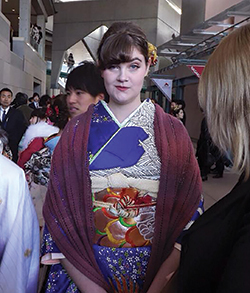 By studying abroad, your understanding of the world is a lot less limited," Ashley Morgan spent 10 months studying Japanese and Japanese culture at Aichi Shukutoku University located near Nagoya, Japan. “I spoke very little Japanese,” she explains. But everyone was helpful and encouraging.